We really like pop molds. They are great way to give the kids an ice cream-like snack, while letting us modulate the sugar intake. And, we make our home-made popsicles out of regular juices and yogurts, so it’s cheaper and greener since there is no extra packaging, say nothing to preservative my kids definitely don’t need. Previously, we’ve said we like SiliconeZone Popsicle Mold. It makes popsicles in a cool castle-like shape. But, here’s another idea I like even more: Cuisipro Sailboat Pop Mold . Not only does it create a cute-looking popsicle that looks like a sailboat with its keel as a popsicle stick, but the deck of the “boat” also collects the inevitable drips. Only drawback is that these are plastic where we now prefer silicone. 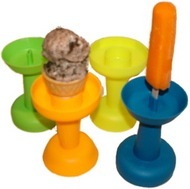 Another simple product for catching ice cream and popsicle drips is the Dripstick for only $3.99.